Dewsbury Moor produced a terrific display to send Humberside outfit Skirlaugh crashing out of the Coral Challenge Cup with a 24-10 victory last Saturday. It proved a memorable first game in charge for new Moor coach Danny Maun as he guided the young Maroons side to a terrific win. 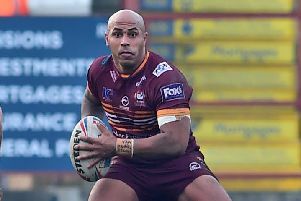 Moor billed the game as their biggest in 20 years as they made a return to the famous competition and they were watched by a large crowd at Heckmondwike Road, which included Batley Bulldogs coach Matt Diskin - himself a product of the club. James Samme was outstanding for Moor and was supported well by Archie Bruce and Brad Foster. Peter Robinson provided the experience and was another in excellent form as he led the Moor youngsters well. There was also a fine defensive effort from AJ Boardman. Moor began on the front foot and led through a Jordan Foster try which Aiden Ineson converted. Skirlaugh replied with a long range interception try and then hit the front when they crossed between the posts. Matty Harling and Harvey Gotts were the Skirlaugh try scorers with Carl Puckering converting the latter to put them 10-6 up at half-time. The Maroons upped their game after the break and a terrific defensive effort ensured the Humberside outfit were unable to add to their tally. Moor scored soon after the re-start when the impressive Archie Bruce scooted over from acting half-back and Ineson converted to edge the Maroons ahead. Bartley O’Brian made a terrific break and found Jordan Foster in support to send him over for his second try, with Ineson’s conversion giving Moor an eight-point lead. In the final minute of the game, Skirlaugh knocked on and George Croisdale was on hand to scoop up the ball and score, with Brad Foster converting to seal a memorable win. Maun was delighted with the result and is looking forward to a second round trip to East Leeds. Maun said: “Everyone seemed to buy into it, with it being the Challenge Cup, and we had a good crowd down. “The 17 who played hadn’t really trained together because of work commitments but I spoke before hand about going out there and not letting themselves down. “Even when Skirlaugh scored, I wasn’t too worried and I knew we could compete with them if we stuck to our guns. “East Leeds will be another tough game but there is no reason why we can’t go there and get a result. Ten of the Moor squad on duty last Saturday have played at the club since the age of six and the Maroons are beginning to see the benefits of a successful youth set up as they prepare for life in National Conference Division One.